Lough Tay on the Guinness Estate in County Wicklow proved the perfect backdrop for scenes shot on board the Norsemen’s longboats in the hit series Vikings. 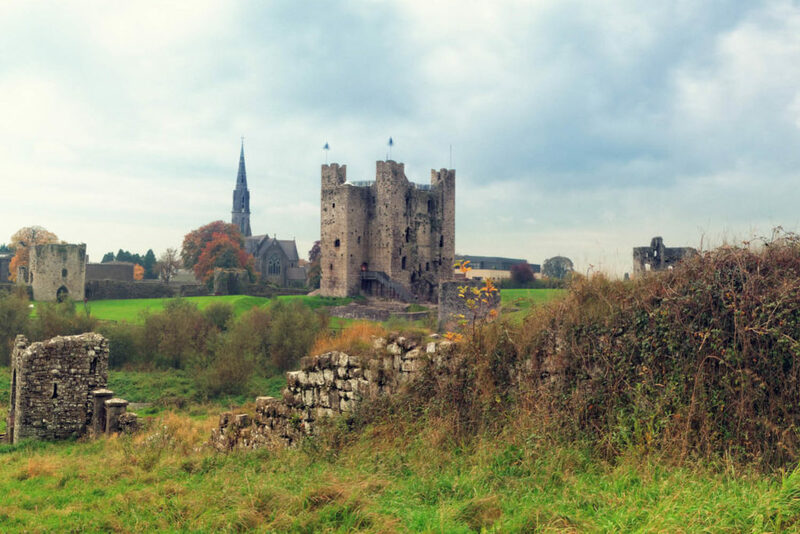 Mel Gibson’s Braveheart stronghold can be visited today at Trim Castle in County Meath. Harry Potter's Horcrux cave was at the base of the famous Cliffs of Moher. 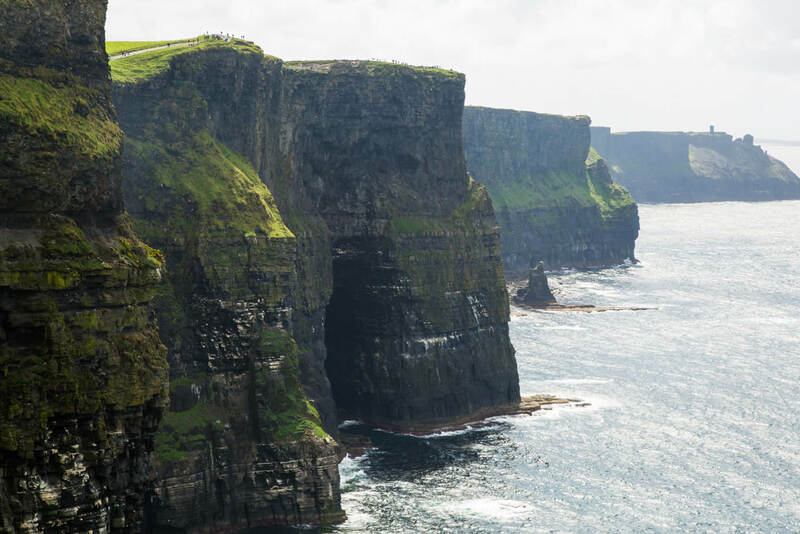 Ireland’s dramatic scenery, with spectacular coastlines and drop-dead gorgeous landscapes, has proven the perfect backdrop for myriad movies over the decades. Writes Tricia Welsh. On my first visit to Ireland nearly 40 years ago, I remember being held up for several hours while driving around the Dingle Peninsula in the island’s south-west as huge boulders were being pushed over a cliff, their thundering sound being recorded as part of the filming of the 1970 film, Ryan’s Daughter. Today, you’re more likely to follow a three-eyed raven and be swept up in the phenomenal hype that is Game of Thrones, since much of it is filmed in Northern Ireland, or see where Harry Potter and Star Wars played out their fanciful tales, or Braveheart and the Vikings battled for glory. Film-lovers can experience the real Westeros and tour the centuries-old castles, mystical mountains, ancient forests and dramatic coastlines used as key filming locations for the Seven Kingdoms. There are 25 epic locations used throughout the fantasy series including Tollymore Forest Park in County Down, transformed into the Haunted Forest where the White Walkers dwell; Dark Hedges, that otherworldly avenue of serpentine beech trees near Armoy in County Antrim that represents the Kingsroad; and Pollnagollum Cave in County Fermanagh, portrayed as Beric Dondarrion’s hideout. There is also Ballintoy Harbour in County Antrim as the Port of Pyke in the Iron Islands, and Downhill Strand in County Londonderry as Dragonstone. You can explore Game of Thrones territory by self-drive or go with a guide, enjoying authentic medieval feasts, meeting direwolves, shooting arrows where Robb Stark taught Bran archery or glamping overnight in Winterfell at Castle Ward in County Down. There’s also the clever Door of Thrones treasure hunt trail, where you can check out 10 intricately carved doors, each telling the story of a GOT episode in Season 6, which were handcrafted from two trees blown down when a storm hit the Dark Hedges in 2016. They now grace pubs close to the series’ filming locations including The Cuan in Strangford, Fiddler’s Green in Portaferry and Percy French in Newcastle, all in County Down, as well as Blakes of the Hollow in Enniskillen, County Fermanagh, and Frank Owens’ Bar in Limavady, County Londonderry. And be sure to see the 77-metre Bayeux-style tapestry, made from Irish linen, which immortalises the first six Game of Thrones series and is on display in the Ulster Museum in Belfast. For fans of the series, there’s no doubt Northern Ireland is Mecca. Fans of this sci-fi classic can feel the force at both rugged Malin Head, the most northerly point of Ireland on the Inishowen Peninsula, and on the windswept island of Skellig Michael, located some 11 kilometres off the Iveragh Peninsula in County Kerry, where Rey memorably met Luke Skywalker for the first time at the end of Star Wars: The Force Awakens. You can take a boat tour to the UNESCO World Heritage Listed Skellig Michael, depending on the weather, to see its awe-inspiring sixth-century monastery ruins. Other location spots include Loop Head in County Clare, Dingle in County Kerry with its resident dolphin, and Brow Head near Crookhaven in County Cork. It is said the Star Wars production team loved this rugged stretch of coastline so much, they kept their cameras rolling along the Wild Atlantic Way from Cork, Kerry and Clare all the way to Donegal. Also check out some of the filming locations for the upcoming Star Wars Episode VIII The Last Jedi set to be released this December. 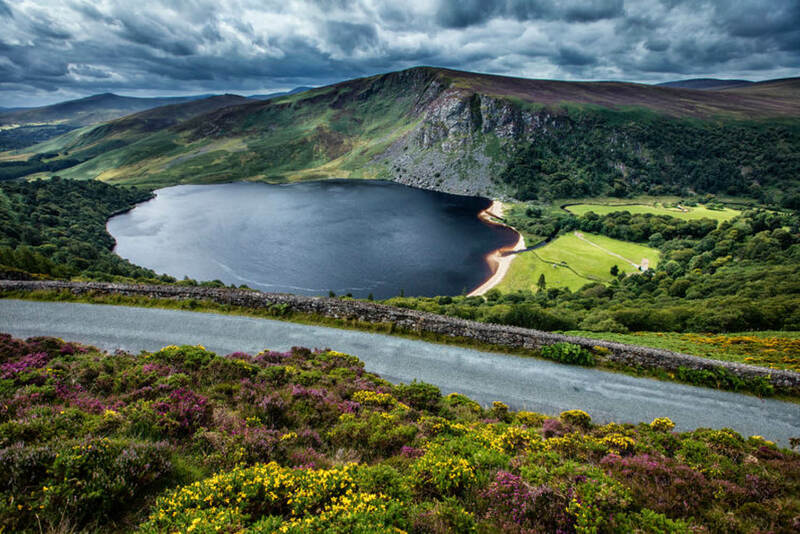 Although the series is set in medieval Scandinavia, the Luggala Mountains around Lough Tay on the Guinness Estate in County Wicklow proved the perfect backdrop for scenes shot on board the Norsemen’s longboats in the hit series Vikings. Similar scenes were also filmed on Lough Dan and Blessington Lakes, the River Boyne outside Drogheda, and the Poulaphouca Reservoir in the heart of the Wicklow Mountains just out of Dublin. Wicklow Mountains National Park, with its glacial lakes, woodlands and beautiful coastline, is only about an hour by car from Dublin, making it an ideal day trip for a guided or self-guided film location tour. Other stand-out movies filmed in Ireland include Harry Potter, whose Horcrux cave was at the base of the famous Cliffs of Moher; Brooklyn and Saving Private Ryan, both of which featured the golden sands of Curracloe Beach in County Wexford; and Braveheart where Mel Gibson’s stronghold can be visited at Trim Castle in County Meath. You’ll find more details about exploring these locations here. Harry Potter’s Horcrux cave was at the base of the famous Cliffs of Moher.